Option "Flagship" chip-set: 115 (117) dB approx. Power Supply Standard version: 12 V DC, 180 mA approx. 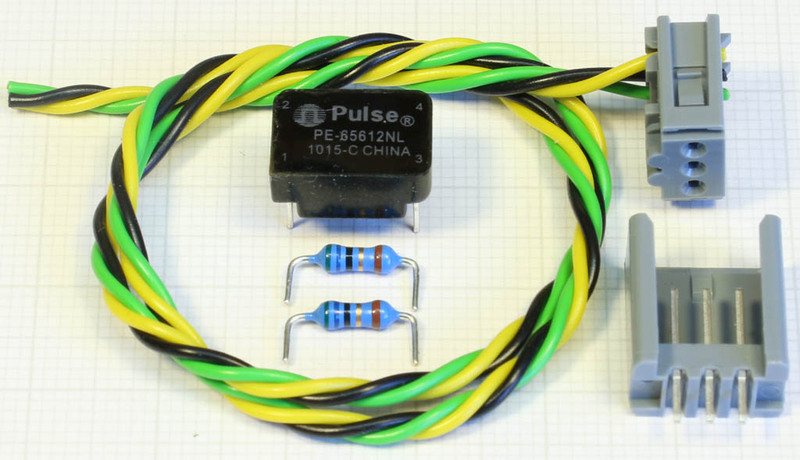 Option "Flagship" chip-set: 12 V DC, 210 mA approx. The data above is measured at my samples and cannot be guaranteed, of course. Note: From revision 4 on only the "Flagship" version is still available. The difference between revisions 3 and 4 is a slight change in the layout. The first 10 sample rates, with the digital audio signal indicated as "Professional Format", are selected in positions 1 - 9. Positions A - F are indicated as "Consumer Format", where you can select 44.1 kHz or 48 kHz only, but each with the options "no copyright asserted", "copyright asserted, original version" and "copyright asserted, copied version". In Consumer Mode the ADC's category code is "General" (00hex). Using a decimal encoding switch would prevent access to the consumer format. A green "Power"-LED is provided. The red "Ovr"-LED on the front lights up, when at least one of the channels is overdriven. If both are overdriven, it is brighter. All connections are made on the rear. The analog, unbalanced RCA inputs have a sensitivity matching the usual CD or DVD player output level of 2 VRMS. As options, a gain switch can easily be connected externally as well as balanced XLR inputs and a selector switch between RCA and XLR inputs. 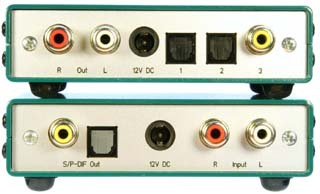 Both digital audio outputs, the optical and the unbalanced RCA output, can be used simultaneously. The RCA output is galvanically decoupled by a digital audio transformer. Also as an option, a third, e.g. balanced (XLR- or AES3-) digital audio output with its own digital audio transformer can be connected externally. The optical output device (the obsolete TOTX177PL or its replacement PLT133) is specified up to slightly more than 96 kHz only, though it works on the workbench up to 192 kHz without any problems. Anyhow, I do not recommend to use it for 192 kHz. The preamplifiers are dimensioned for an input sensitivity of 2 VRMS approx. at 100% FS, a usual level e.g. for CD or DVD players. When the balanced XLR input option is used, the input sensititvity should be reduced to the standard studio level of +4 dBu (1.23 VRMS) plus a reasonable headroom of e.g. 12 dB. I.e., 4.91 VRMS (+16 dBu) for 100% FS might be a good choice. Meanwhile I offer the AD24QS in the "Flagship" version only, i.e., "Flagship" is no longer an option but the new standard version. 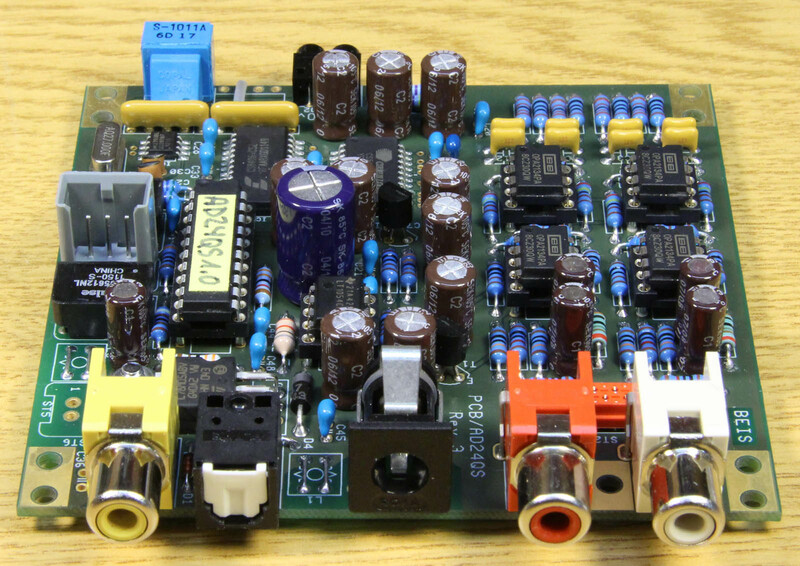 Compared to the former standard version, it consists of a significantly more expensive ADC-IC which the manufacturer calls his "Flagship" and better (and more expensive) op-amps. An approximately 6 dB higher dynamic range than with the standard chip-set is achieved. For more measurements I made on the previous prototypes read the corresponding article about the AD2496. 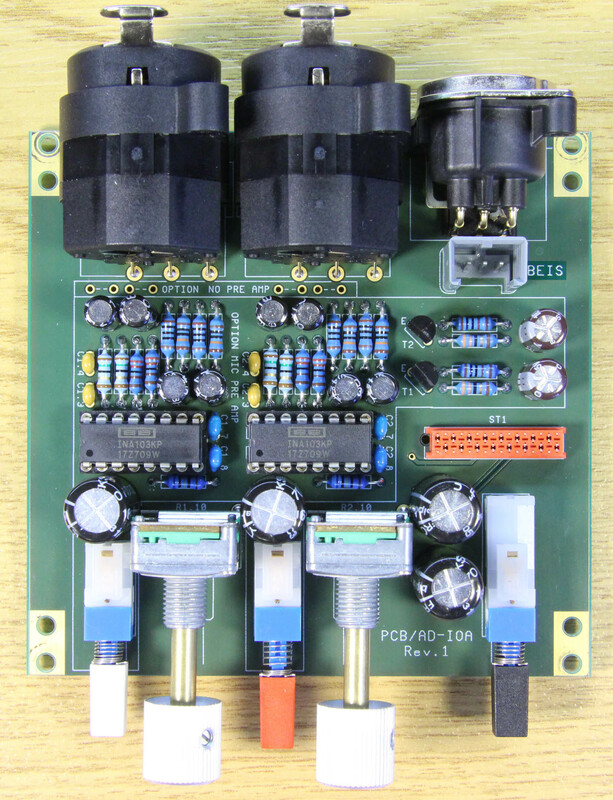 The nominal power supply is 12 V DC, but up to 15 V are allowed. The current consumption is about 180 mA for the standard and 210 mA for the "Flagship" version. I use regulated power supplies even though unregulated ones are ok, too. 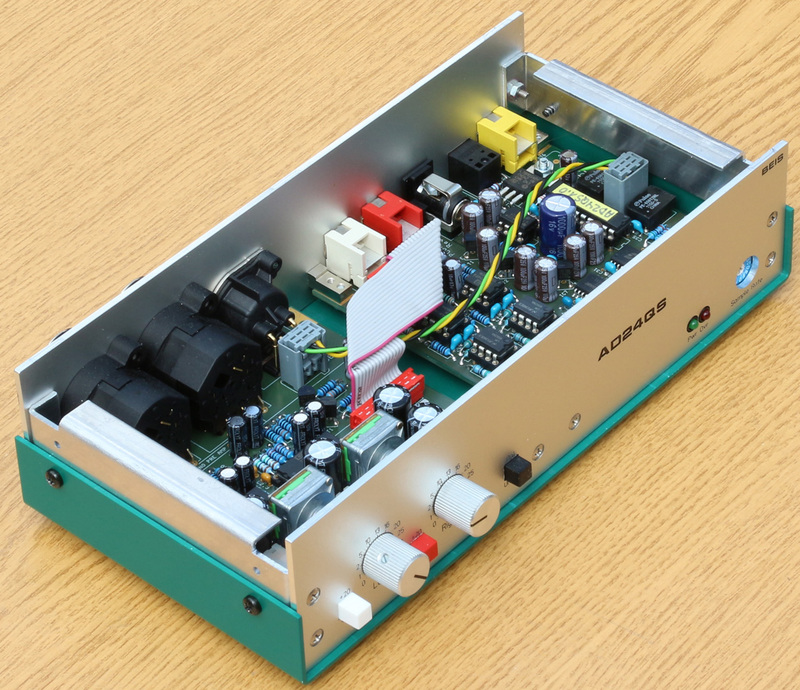 Due to the ADCs' high power supply rejection ratio only very little hum from unregulated power supplies remains in the output signal so that the ADCs' dynamic range is not decreased noticeably (unweighted measurements). BTW, I measured with a full-wave rectified 9 V transformer (i.e., without buffer capacitor) the same dynamic range as with a regulated power supply. Even in the worst case with a bare 9 V AC supply (which is possible, too) and the "Flagship" chip-set the dynamic range was decreased by less than 1 dB. Only in the spectrum you can observe the effect of an unregulated power supply. For the current circuit diagram of the AD24QS, have a look either at the GIF-file or the PDF-file. The analog stages up to and including the ADC-IC's input are designed fully balanced, though, in the basic kit version, the input jacks are unbalanced only. The first stage serves as input buffer but an additional amplification can be introduced there, too. The second stage is a balancing 2nd order low-pass Butterworth filter with a corner frequency of 190 kHz approx.. 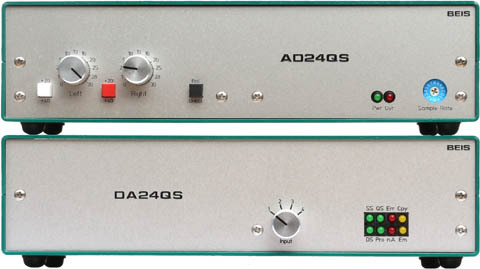 The AD24QS can be equipped with external professional, balanced audio inputs (XLR) and also with an external switch to select between the on-board unbalanced RCA or the external XLR inputs. Extension features: For the balanced inputs and the adjustable gain option an additional connector can be placed. 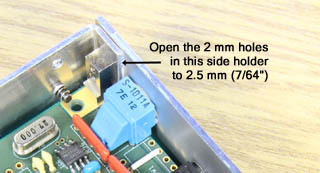 This Micro-Match (or compatible) connector does not only carry the audio and gain adjustment signals but the power supply, too. 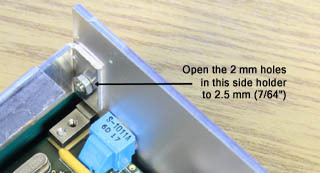 On the photo you can see the position for this Micro-Match connector, but it is not populated there. The AD-IOA, an input/output extension module, takes ample advantage of all these features. 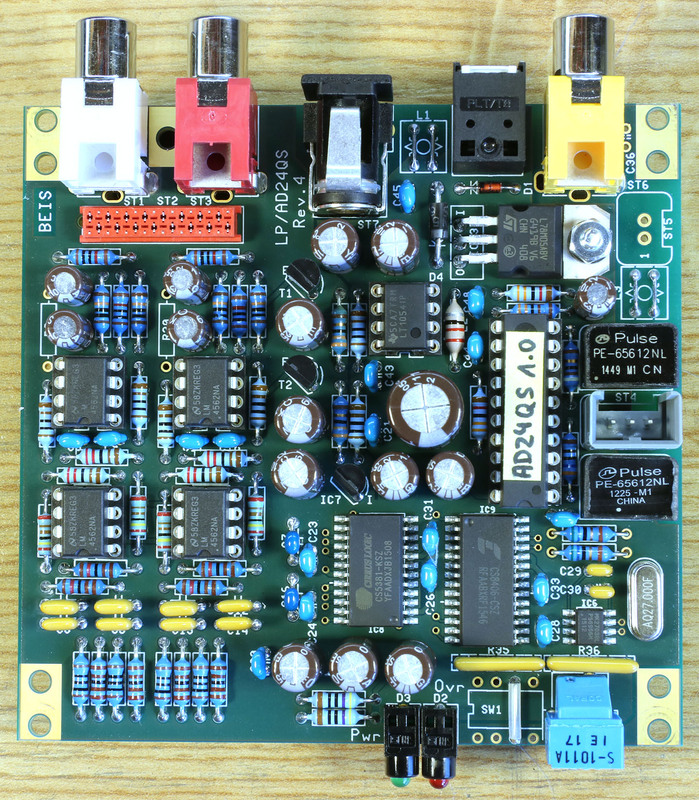 The Cirrus Logic CS5361 is a high quality 114 dB delta sigma A/D converter. 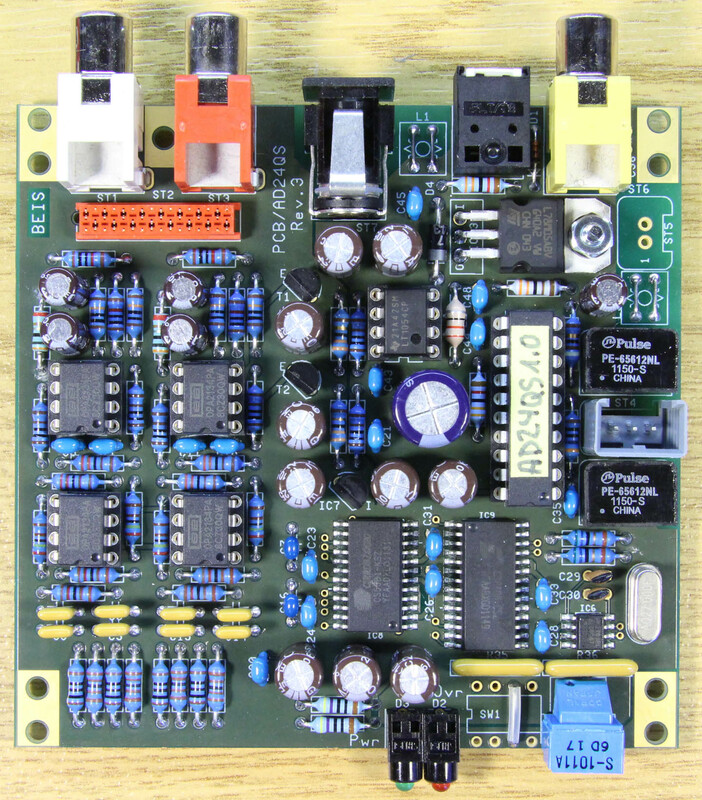 The reference supply is a simple 78L05A, but there is no reason for concerns about its noise as reference voltage noise is very well filtered by the ADC's external filter components. 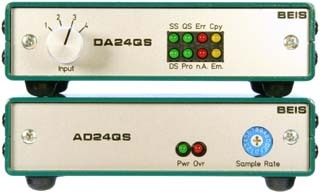 From revision 4 on I offer the AD24QS with the even better and significantly more expensive 120 dB ADC CS5381. 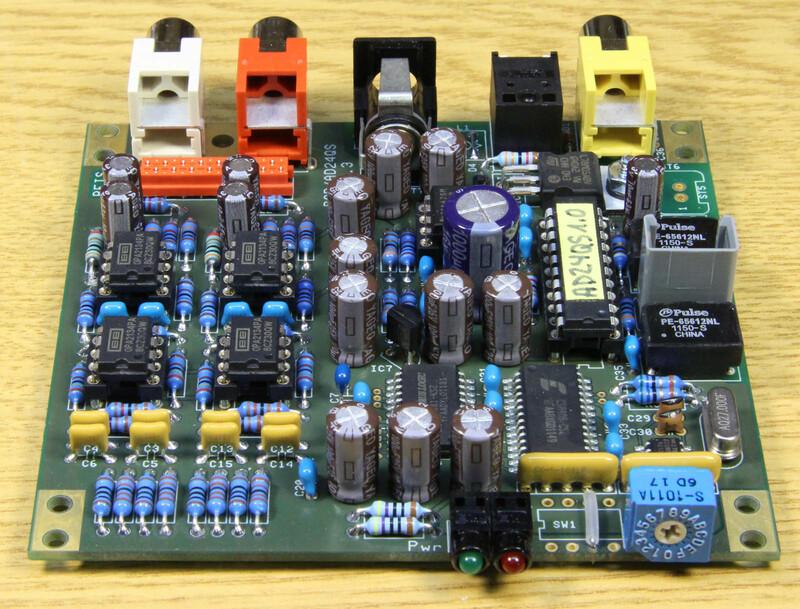 The clock generation is done by an MK2703S, a "PLL Audio Clock Synthesizer", which is an oscillator and PLL circuit for the 44.1 kHz and 48 kHz based oscillator frequencies derived from a single 27 MHz crystal. I use a Cirrus Logic CS8406 "192 kHz Digital Audio Interface Transmitter" in hardware mode. The hardware mode provides enough functionality, i.e., signal inputs for control, for my goals. 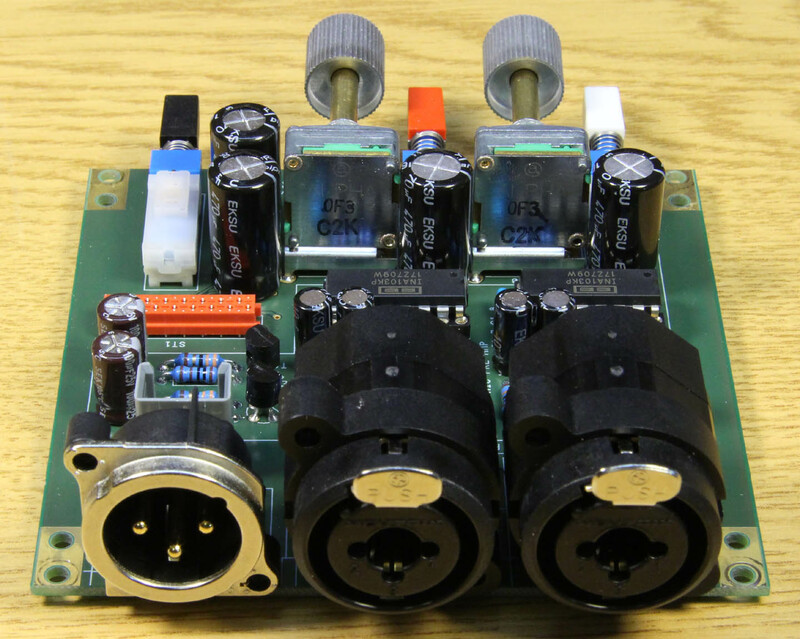 Three digital audio outputs can be connected to the S/PDIF transmitter's outputs: One optical output device (Toslink TOTX177PL or compatibel), one unbalanced electrical output (0.5 VPP @ 75 Ω terminated). Moreover, the AD24QS can be equipped externally with a professional digital audio output, either balanced (XLR, AES3, 2 VPP @ 75 Ω terminated) or unbalanced (BNC, AES-3id, 1 VPP @ 75 Ω terminated). 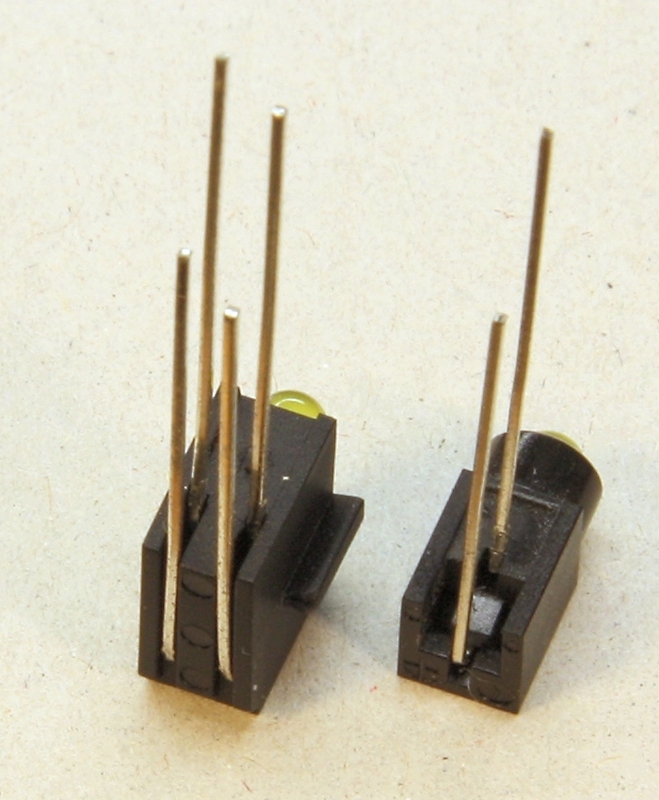 The decoupling transformer and the termination resistors are provided on board. The optical output device (TOTX177PL resp. PLT133/T8) is specified up to slightly more than 96 kHz only, though it works on the workbench up to 192 kHz. Anyhow, I do not recommend to use it for 192 kHz. At the end of 2011 during a great flood in Thailand Toshiba, the manufacturer of the Toslink devices, lost all of its Toslink audio components production equipment and decided not rebuild the facility and not to resume the production. Since then only remainders of these components are available world wide. There are other manufacturers left but for me it seemed more or less impossible to get parts from them in the small quantities I needed. Finally I was lucky with fully compatible parts from Everlight. The TOTX177PL, which is still mentioned in the documentation, is replaced by PLT133/T8 (and the TORX147PL in the DA24QS by PLR135/T8). The digital audio transformer for the coaxial signal is not specified for 192 kHz either, but when you have a look at its frequency response or its pulse transmission characteristics you understand why I unscrupulously use and recommend it. It would be fine for even much, much higher frequencies than 192 kHz. In order to achieve these many sample rates I had to introduce a more complex logic than on the AD2496. It is still a static circuitry, but too complex for one or two logic gate ICs. So I was forced to use some kind of programmable logic and chose a GAL16V8, the simplest, smallest and cheapest one that is available (except that, in order to save power, I recommend the slightly more expensive quarter power version GAL16V8Q or equivalent). In kits, you'll get them programmed. 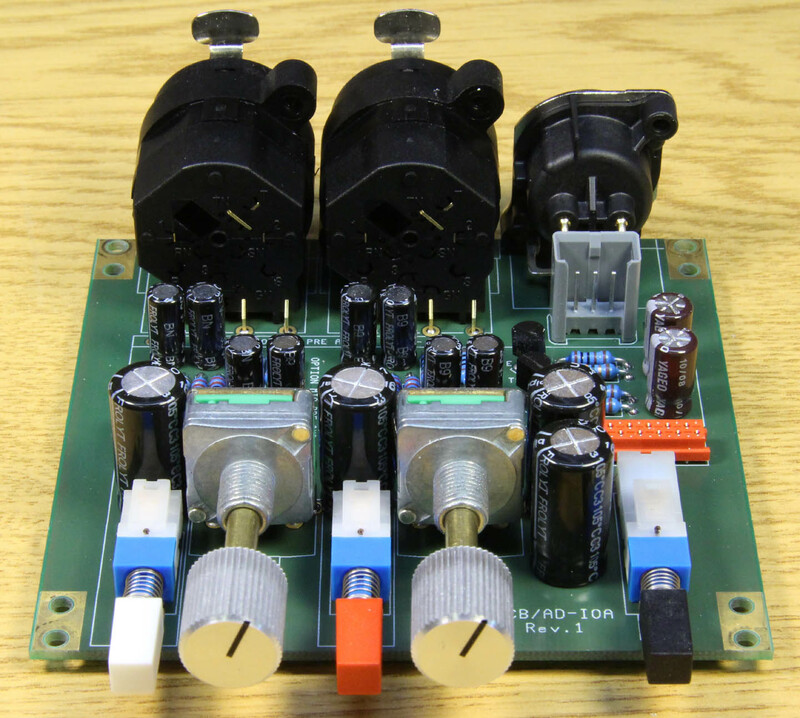 The nominal supply voltage for the device is 12 V, but up to 15 V are allowed and it operates down to 10 V or less. The power input is protected against polarity reversal and buffered with an extra large, 1000 µF capacitor. 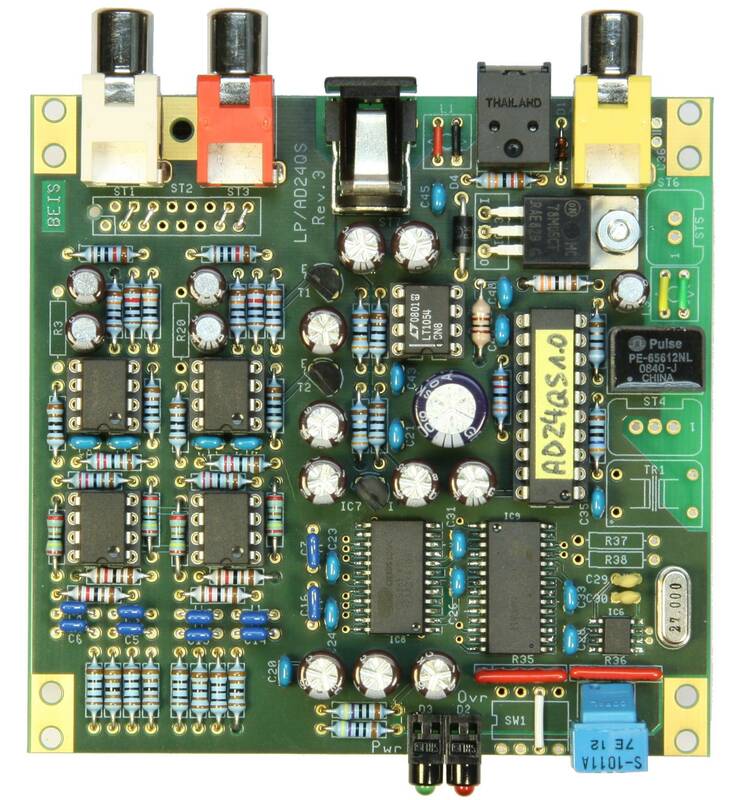 The digital part of the AD24QS operates at 5 V. I use a linear regulator, a standard 78M05 in a TO220-package, to regulate the digital supply voltage. Like in the DA24QS, the negative analog supply voltage is generated by a DC-DC voltage inverter (LT1054, up to 15 V / 100 mA) and both, the positive and the negative analog supply voltages are smoothed by one low-pass emitter follower each. For the circuit diagram of the AD-IOA, have a look either at the GIF-file or the PDF-file. one 3 wire IDC cable, 135 mm long, for the AES3/EBU digital audio output. Both cables are prepared and intended to be used as on this photo. All additional components on the AD24QS which are required for these modifications are part of the AD-IOA kit. For the interconnection populate the ribbon cable connector ST2. For the gain control populate R3 and R20. For the recommended gain range of 30 dB R3 = R20 = 30R is necessary. When the variable gain potentiometers are used the minimum input sensitivity is risen from 2 VRMS by 6 dB to 1 VRMS. In order to suit to e.g. usual CD players the minimum input sensitivity needs to be less than 2 VRMS and hence should be decreased again by replacing R8/11/25/28 (2k2) by 5k36 and R9/10/26/27 (2k4) by 5k9. This measure reduces the minimum input sensitivity by approx. 7.4 dB. I.e., in connection with the AD-IOA and its potentiometers for variable gain the minimum sensitivity becomes 2.35 VRMS. For the digital audio output populate the corresponding digital audio output components R37, R38 (56R each), TR1 and ST4. For different reasons I am allowed to sell these converters as kits and thus for DIYs only. I expect sufficient experience from people to assemble the kits. I don't explain how to read resistor values, how to discriminate a 100 µH inductor from a 100 Ω resistor, which components are polarized and so on. Though I don't find it to be really difficult to solder SO-IC packages, on the kits the 3 SO-ICs (CS5361/81, CS8406 and MK2703) are already soldered. What even happens to me is to mix up similar looking resistors, put components in the wrong places, rotate ICs by 180° or forget to solder all joints. Usually all this soon becomes quite obvious and can easily be corrected. The kits I provide come with all necessary electronic and mechanical parts for the basic version of the ADC, the AD24QS-K (unbalanced inputs, no gain adjustment, no connector for balanced inputs, no 3rd digital audio output.) The GAL is programmed. The kits come without an enclosure, front or rear panel - just as you can see on the photos. See the BOM AD24QS-K (bill of material) what is actually included in the AD24QS-K kit. In case you order the AD-IOA kit, all components that are additionally required on the AD24QS-K come with the AD-IOA kit. See the BOM AD-IOA (bill of material) what is actually included in the AD-IOA kit. 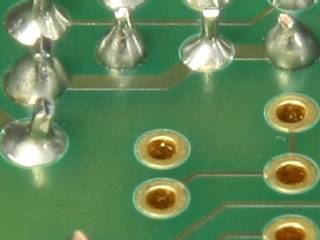 Normally, all axial components, i.e., resistors, diodes and inductors, come cut and bent. This saves a lot of assembly time for you and may help that the assembly looks neater. Not all components on the board need to be populated. They are partially intended for options. Which one is to be populated and where is shown in the assembly drawings. 9 jumpers, indicated red in the assembly drawing, must be placed: 4 at ST2, 1 at SW1 and 2 each at L1 and L3. For the longer wires I prefer colored insulated ones because it looks better. The photos on the right show how the LEDs must be built into the LED holders, their polarities (the long leads are anode) and how the leads must be bent. Click on the photos to enlarge them. Note that both LED holders have an up- and an underside. 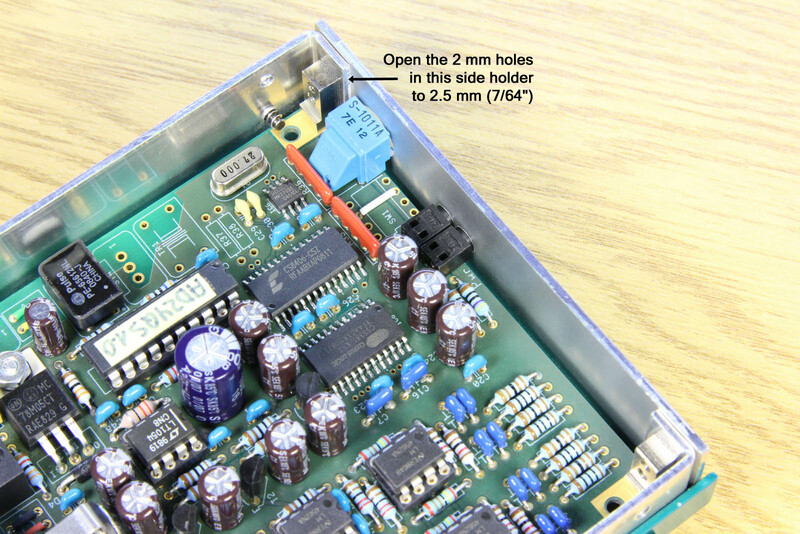 The photo on the right shows how to prepare the transistors and ICs in TO92 cases. Unfortunately I cannot easily get the leads bent as originally planned, so they must be bent correctly by hand during assembly. I intended the pad layout in a triangular shape with 0.1" (2,54 mm) pitch. Today most TO92s come with all leads close to each other in one row (both left transistors) or, the tape-and-real version, like the TL431 in the middle. Do not force TO92s with such unsuitable leads into their holes! Try to bend them like the rightmost ones which I bent manually. Each lead is bent twice. Do not bend the leads directly at the case because the case as well as the leads would be very much stressed and endangered. After bending, they should more or less "fall" into their three holes in the PCB. Place the distance holder underneath the crystal so that the crystal's case doesn't have direct contact to the PCB and the leads are soldered at some distance from the case. Up to now I used HAL PCBs (hot air levelling, which basically means tinned). They are shown on many of the photos you see here. The newest PCBs I ordered have more expensive gold flash plated surfaces. I didn't choose that because it "sounds better" or because the board might become more reliable - I simply experienced that because of the different colors forgotton solder joints are very clearly visible. 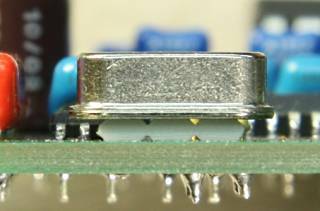 Also in the past I experienced that forgotton solder joints are one of the most common causes for malfunction. With this in mind I actually had no other choice than to use gold flash plated PCBs. *: These are the default values for the kits. The can be changed according to the user's requirements, see text. From revision 4 on 120 dB Dynamic Range (formally option "Flagship" Chip Set) is no longer an option but standard. 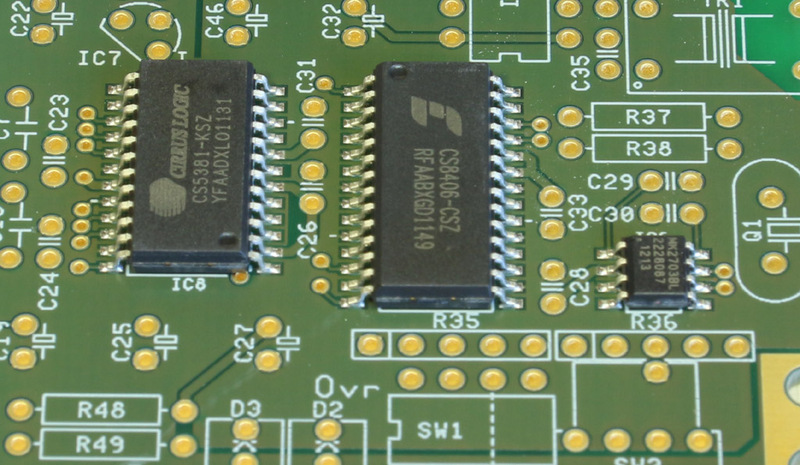 The CS5381 is a 120 dB ADC, pin compatible to the 114 dB CS5361. It has slightly more power consumption and is significantly more expensive than the CS5361. In order to maintain its extremely high dynamic range I recommend to use better (and again significantly more expensive) low-noise, dual op-amps, e.g. LM4562 from National Semiconductors instead of OP2134. With CS5381 and LM4562 I measured an increase of 6 dB for the dynamic range. 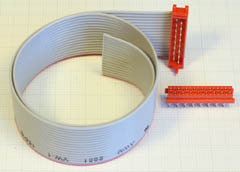 Input Selector, Balanced Inputs, Variable Gain (Option Set for balanced inputs): In case you want one or more of these features but without the AD-IOA, I can offer the particular Micro-Match connector set with the appropriate ribbon cable for the on board connector ST2, as you can see at the right hand photo. You can also refer for these connections to the circuit diagram of the AD-IOA. Input Selector: With an additional switch (2 x change-over per channel), wired to the Micro-Match connector, it is possible to switch between the on-board unbalanced RCA inputs and the external, balanced XLR or TRS inputs. The switch must be connected where in the schematics currently the 4 jumpers at ST2 are indicated. Also refer to the circuit diagram of the AD-IOA. 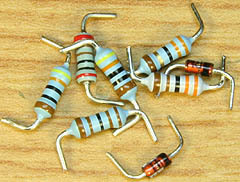 Variable Gain: By using additional resistors variable gain is available. Populating R3 and R20 and one external variable resistor each between ST2 pins 1/2 and ST2 pins 11/12 the gain can be increased according to the table shown in the circuit diagram. E.g., with R3 = R20 = 430 Ω a maximum gain of 15 dB is achieved. The external variable resistors may be either switched for a set of precise fixed gains or potentiometers, preferably negative logarithmic ones. You may also refer to the circuit diagram of the AD-IOA. Balanced AES3 Output (Option Set for AES3 output): For the balanced digital audio output another digital audio transformer, a connector set and two resistors are needed. The option "Set for AES3 output" contains them all as you can see on the right hand photo. This feature is also supported by the AD-IOA and these components are also part of the AD-IOA kit. RB = 1.1 x RA. R9 = R10 = R26 = R27 <= 5.1 kΩ. R9 = R10 = R26 = R27 <= 10.0 kΩ. When variable gain potentiometers are used the situation becomes more complex. 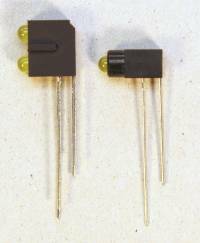 This is why in connection with the AD-IOA even for the unbalanced inputs resistor values of 5.36 kΩ and 5.9 kΩ are allowed. 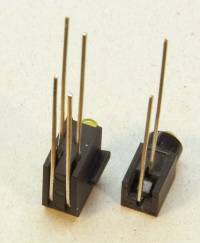 EMC chokes: For an improved EMC (electro-magnetic compatibility) the board is prepared for two common mode chokes, L1 and L3. One is for the power supply input, the other one for the unbalanced, digital audio output. I pay attention to EMC performances but I am not able to test them. I prepared the chokes "just in case". Under normal circumstances they are not required. Anyway, the ADC should always be installed into a well shielding enclosure! Word Clock Synchronization: I used to offer a word clock synchronization module, the XS-AD24. Should you be interested, read about it in the article "XS-AD24: VCXO-based Word Clock Synchronization for the Audio-ADC AD24QS". I'm sorry that the XS-AD24 is currently not available because it is either awfully difficult or awfully expensive to purchase appropriate VCXOs (case 5 x 7 mm, 5 V, pull range > +/- 100 ppm). Maybe in future it will become available again. For my units I used an SG 206 or SG 210 resp. enclosure from the (German) company Fischer Elektronik. In contrast to the pictures you see here, these enclosures are no longer available in opal green from the manufacturer. I still stock SG 206 in opal green (SG 206 GO), but the SG 210 now comes in black (SG 210 S). 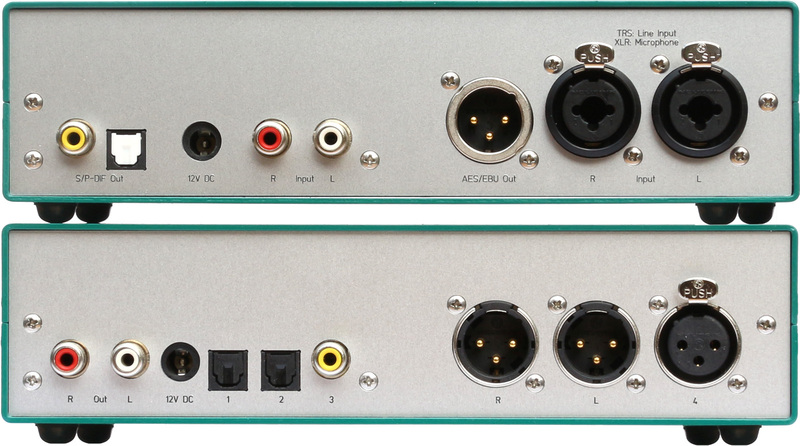 Front panel, enclosure and board are directly fixed to each other using the element 5.60.422 from the (German) company Ettinger, available at Bürklin. Note: The dimensional properties of revisions 3 and 4 are identical. 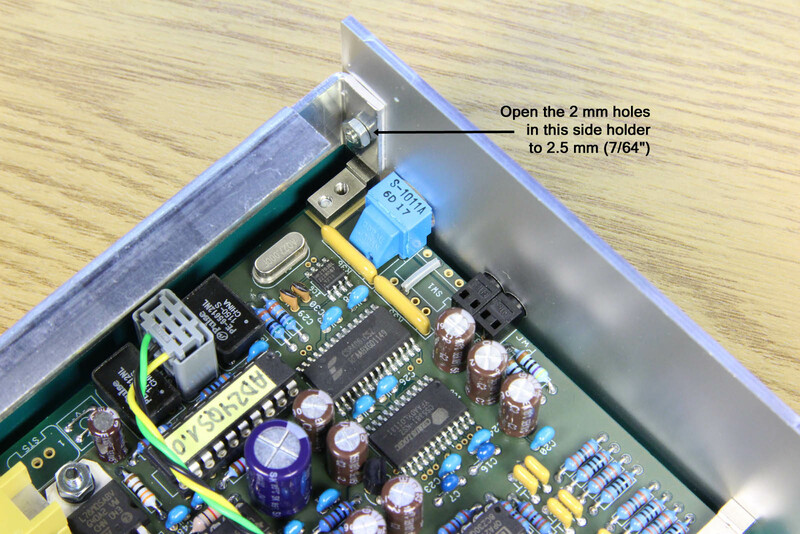 You will see there how the board is fixed within the SG206/SG210 and how it can alternatively be fixed directly to other front panels. Of course you may also use four stand-offs, distance bolts or distance tubes to fix the board on the bottom of your enclosure. The drilling positions can be found in the dimensional drawing, too. The mounting elements 5.60.422 are intended to be used either standing (particularly in the SG 206 enclosure, left photo) or lying, e.g. 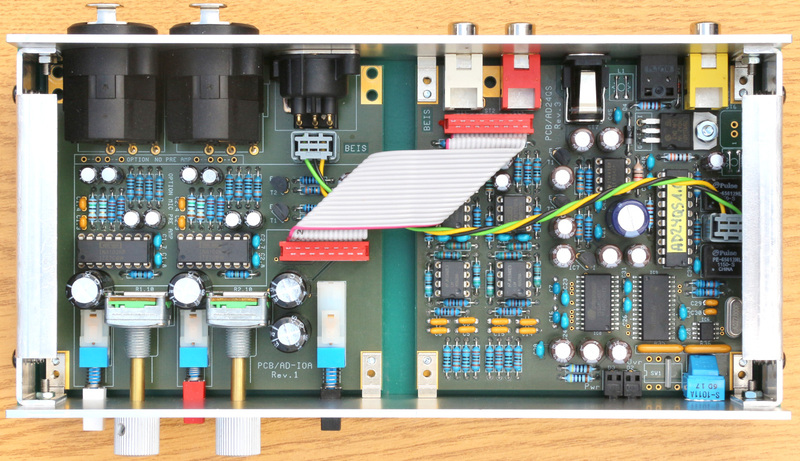 in the SG 210 enclosure (right photo) or behind any other front panel. The front and the rear panels shown above are manufactured by Schaeffer AG (in Europe) and are available in the US from Front Panel Express, LLC, too. You need the design files for these panels, then you just have to send them to the manufacturer and you'll get a perfectly milled and engraved panels, as the photos show. You may also modify the design files with the front panel design software "Front Panel Designer" German, English or French (it's free and very convenient) so that it fits to other enclosure of your choice. All companies mentioned above have international branches, e.g. in the USA. ... is explained on page AD/DA24QS_Order.